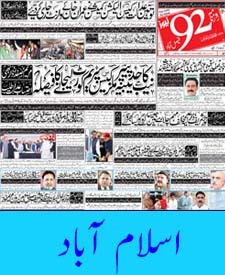 The most trending and purely liked news channel of Pakistan the “92 Newspaper” is an Urdu newspaper launched after the great achievement of HD plus news channel in all Pakistan. 92 News Media published roznama 92 News paper, which is a countrywide Urdu news paper. The top quality and ranked newspaper bring up to date the public with latest Local, national and international events all over the provinces and major districts.. The famous and seasoned journalist Muhammad Haider Ameen looking this newspaper as Editor-in-Chief, while Mr. Irshad Arif supervises this 92 daily newspaper as Group Editor. The most read newly launched 92 news papers is initiated and launched since of public consciousness about current political and commercial circumstances of the country as well as international political position. 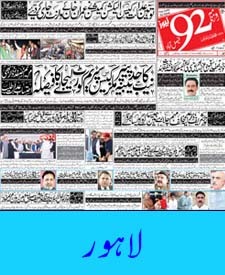 This daily 92 news paper published from Lahore, Karachi and Islamabad. 92 News roznama has an experienced team of journalists just like Sajjad Mir, Izharul Haq, Khalid Masood, Oriya Maqbool Jaan, Mustanser Hussain Tarrar, Arif Nizami. Similarly this 92 news has a large network of talented news reporters from all cites of Pakistan. 92 HD News provides latest news from politics, business, sports, showbiz and it also covers latest global situation.92 Urdu Roznma also publish latest current jobs is various Govt & Private departments and this news paper is also available online through epaper. 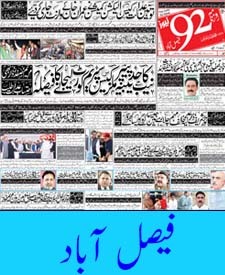 Read online Roznama Live 92 News Epaper here by www.roznama92news.com here.